Should You Choose Laminate or Hardwood Flooring? With today’s technology, laminate flooring is a strong alternative to hardwood. While the look of laminate and hardwood flooring may be similar, knowing the differences between laminate and hardwood flooring will help you make the best choice for your home and budget. Here are some quick comparisons. Construction. Wood materials are pressed together to make a plank. The top layer is a photographic layer made to mimic various surfaces like wood and stone. It can be installed in basements. Repair. Minor scratches can be repaired, but new flooring needs to be installed for major repairs. Since laminate is made of composite wood, it cannot be refinished. Construction. This flooring is made of solid wood. The look of the wood comes from the natural state of the wood itself. The grain and color are unique. Installation of hardwood flooring below-grade is not recommended. Repair. Minor and major damage can be repaired. Hardwood floors can be refinished multiple times throughout their life. Even though the materials vary, cleaning hardwood and laminate flooring is basically the same. You’ll want to set up a maintenance routine of daily dust mopping, weekly cleaning with a vacuum/wet mop and a deep clean/polish every few months or as needed. A proper maintenance plan will help keep your floors looking great for as long as you own your floors. Every hardwood floor opens up a remarkable range of style and design options. There are floors that harken back across the ages and continents to exotic times and places. That means you can create a completely different ambiance in every room of your home inspired by nature’s extraordinary diversity. Midway through the decade, designers are moving away from overusing stainless steel, chrome and brass in favor of the smooth natural elegance of smoked woods. A soft palette of grey, taupe, white and cream tones offers a lovingly lived-in look and a subtly rich texture that changes with the light. With “Au naturel” you find the raw beauty of wood in all of its finishes. What catches the eye is the intricacy of the grain. Nature’s patterns are revealed to soften any décor. Isn’t that the appeal of a seaside resort—an invitation to reconnect with the natural world? Part of the contemporary scene is built on a healthy reverence for the past. Rich Vintage evokes ancestral grandeur as easily as it does the simplicity of the homestead. Not surprisingly, rugged and warm browns dominate here, from deeply hewn to honey golden. Who said flooring has to stay in the lines? Intricate patterned wood floor installations were the hallmark of wealth and status back in the day because it meant you could afford the artisans. With state-of-the-art technologies, you can create easy-to-install elegantly patterned hardwood flooring. You can create a truly original space that plays with grain, line, light and texture. With all the different flooring options available, hardwood flooring may seem like an expensive option. However, hardwood flooring remains the best choice in having a space that is safe and clean with low maintenance. When you consider the overall life of a hardwood floor, the benefits of wood flooring outweigh the initial cost. One of the biggest advantages of hardwood floors is that hardwood flooring is a more sanitary option than other floor types. When thinking about carpet vs. hardwood, a good amount of dust, germs and other debris get absorbed into the carpet fibers. With hardwood flooring, there is no place for debris to hide, making for a healthier, safer living environment, especially for allergy sufferers. Generally, hardwood floors cost more than carpeted floors, but they also require less maintenance. Because hardwood floors are typically sealed surfaces with a protective layer of finish, wood floors are more stain resistant than other types of flooring. One of the benefits of hardwood floors is that they can be repaired and refinished. Hardwood floors do get scraped, scratched, scuffed, dented and damaged – especially in high traffic areas. However, wood flooring can most often simply be sanded, smoothed and refinished. It is rarely necessary to replace a wood floor. Another advantage of hardwood floors is the environmental factor. Wood flooring is the most abundantly renewable flooring material available. The U.S. Forest Service states that the annual net growth for hardwoods is greater than the average annual removal rate. This means that trees are growing faster than they are being used today. Wood floors also use less water and energy to produce and can be recycled at the end of their life cycle, making it an extremely sustainable product. Considering the differences in producing carpet vs. hardwood, carpet uses more synthetic materials to produce and is treated with more chemicals than hardwood. Also, hardwood not only brings beauty and value to a home, but it can truly last a lifetime while carpet needs to be replaced every 10-15 years. Probably the biggest benefit of hardwood is its unique and beautiful look. Hardwood is one of the oldest flooring materials there is, and it never goes out of style. Because of the large variety of trees and wood types, a world of colors, consistencies, designs, and grain patterns are available. Hardwood floors also increase the value of a house. Whereas many new homeowners will remove carpeting when they buy a house, a gorgeous hardwood floor is usually a reason why a house is bought. When it comes to choosing the right wood for your floors, you must consider the differences between domestic and exotic wood. Each type has its own benefits and strengths. Domestic and exotic hardwood lumber bring together a wide range of aesthetic and practical considerations when choosing your hardwood floor. They all vary with different characteristics like color, hardness and availability. 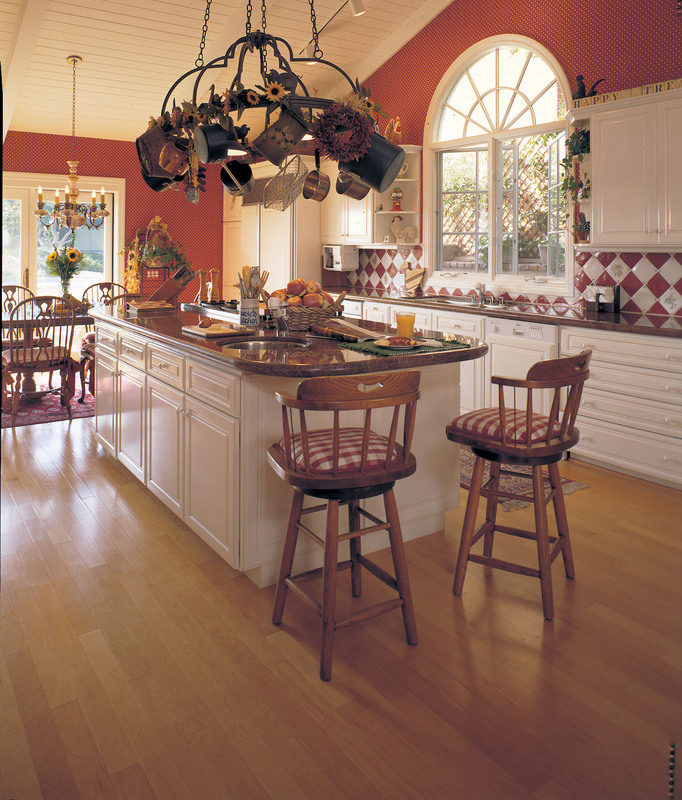 Domestic hardwoods refer to any and all species found in North America like Oak, Birch, Maple and American Cherry. Domestic hardwood flooring is considered to have a warmer, more traditional appearance. Exotic hardwoods are species found around the world, usually coming from the more tropical areas. Some common exotic species are Brazilian Cherry, Brazilian Walnut (Ipe), Purple Heart and Australian Cypress. Exotic hardwood flooring is considered to have a more striking appearance, giving off a more contemporary/modern look. The natural change in color of all wood species over time is a process caused by oxidation and exposure to light over time. This can happen on finished and unfinished wood and varies by species as to whether it darkens or lightens in color. Exotic hardwoods such as Brazilian Cherry may change color very rapidly and drastically while a domestic hardwood like Red Oak may be much slower with minimal changes in color variation. Check with your floor care professional to get a better idea of what to expect when your floors age. A wood floor is only as hard as the species of wood that is installed and not determined by the finish topcoat. Domestic hardwoods are softer than most exotic species, ranking in the low-medium range in hardness. Exotic hardwoods are harder and denser than domestic wood. However, it is important to remember that hardness is not the only factor when considering a durable floor. With modern industry practices, both types of wood will provide you with a floor that will last a lifetime. When it comes to domestic vs. exotic hardwood flooring, availability can become a key issue. The availability of species will depend heavily on specific trends in your area. Because of availability issues, some exotic hardwoods may only come in specific sizes and cuts. Generally, some people choose domestic hardwood flooring over exotic to support sustainable practices and local jobs.